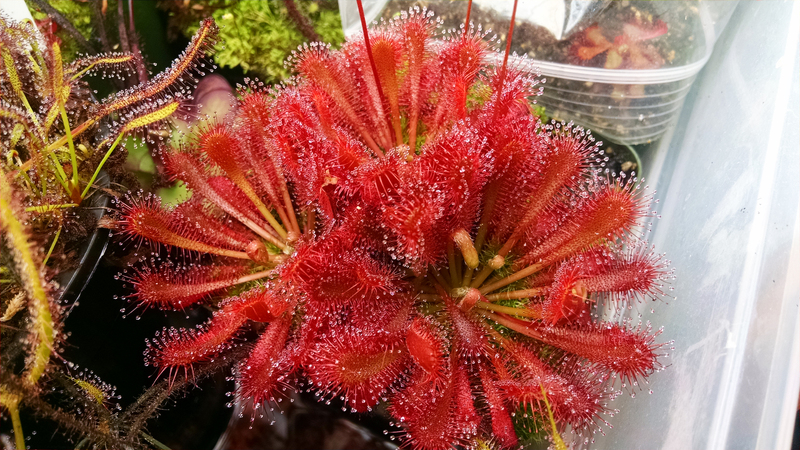 Aphids: My Tiny Foes |Sundews Etc. This aphid thing is getting out of control. Aphids all over Drosera capensis Baineskloof. There are several pots in my collection that look like this. Limited applications of Pyrethrin haven't proven effective, and I'm not willing to use it more heavily, considering that several different species reacted poorly even to the light applications. I've ordered some Bayer 3-in-1, which is a rather toxic systemic. Luckily this is my indoor collection, so I'm not too worried about hurting pollinators or anything. I just...I need to get rid of the aphids. I've been busy lately, and the aphids are just another discouragement when it comes to spending time with my plants. Okay, let's cheer ourselves up. 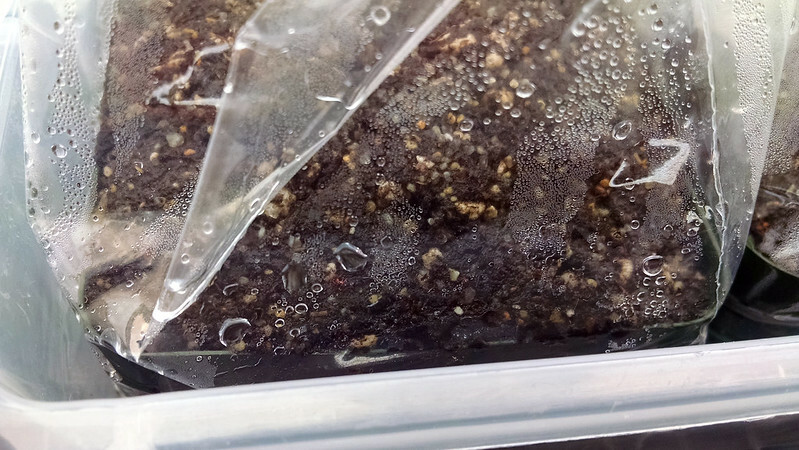 I've got a couple Drosera tomentosa germinations! It's easier to see if you click through to the large sized photo. Just a couple, but this seed sat around for a while before I got around to sowing it, so I'm happy with anything. I picked up a really nice wide-leaf Drosera capensis on my last visit to California Carnivores. 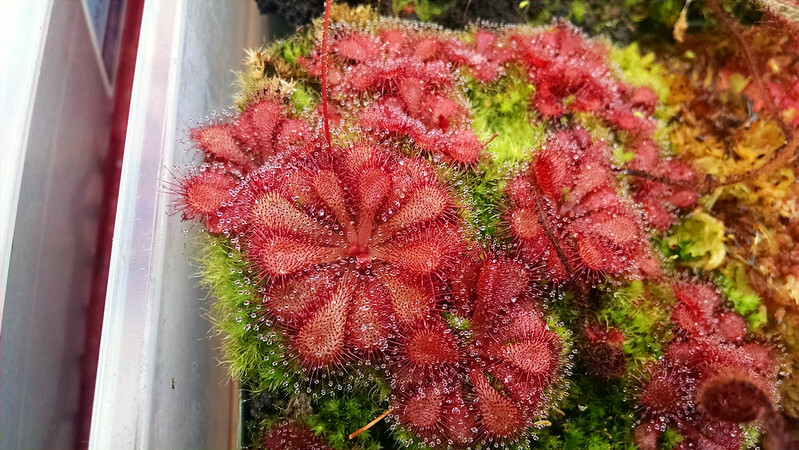 I feel like more people are digging D. capensis lately. That's awesome. Big, strappy leaves. 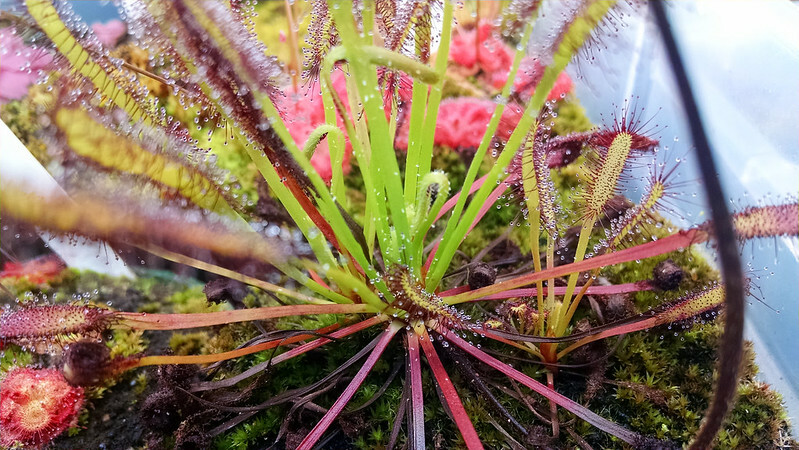 You can never have too many D. capensis varieties. 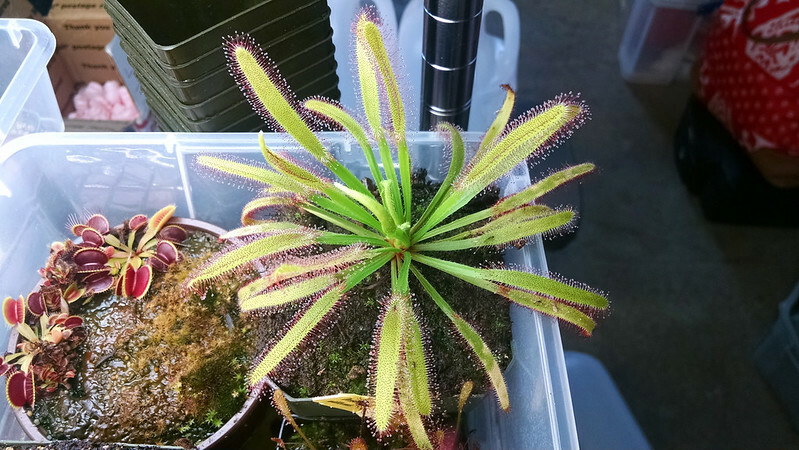 My Drosera ultramafica × spatulata was looking spectacular so I had to take a photo. A prize-winning plant! Love this hybrid. Easily the brightest red plant in my collection, and an easy grower to boot. Finally, my Drosera natalensis pot is also looking excellent during this period of neglect. Fluorescent lighting really shows the dewdrops well. So dewy and perfect! I like the nice color contrast with the moss as well. Okay, I feel better now. I'll feel a lot better once I get this infestation under control though. If you mean Bayer all in one, watch out, it has fertilizer!